Maharashtra Housing and Area Development Authority (MHADA) is going to put over 1,000 more Affordable Houses for sale in November 2018. MHADA Lottery 2018 will enable homebuyers to buy 1001 low-cost houses in the Mumbai city and Suburbs. 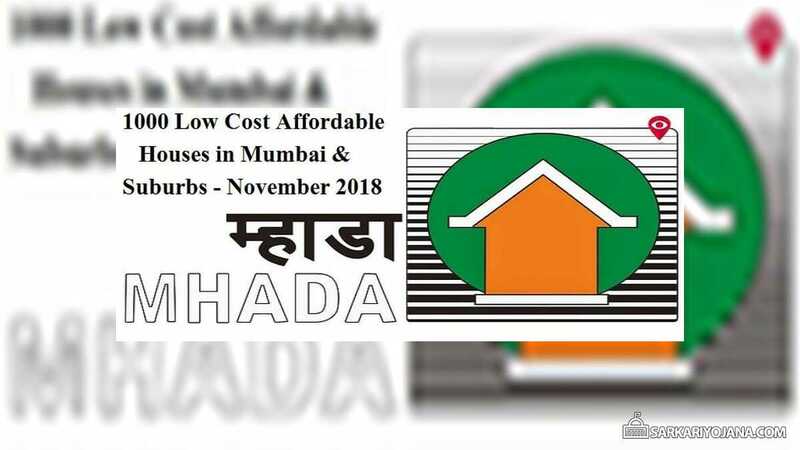 MHADA will start inviting November Lottery online applications from September and will conduct lottery for sale of these homes around Diwali season. The complete details of homes to be put in the lottery are described in Advertisement Listing. Its areas will soon be published in the next few weeks. These houses will be located in the areas such as Ghatkopar, Vikhroli, Mankhurd, Wadala, Sayan, Kandivali, Goregaon and Mulund. Latest Update – MHADA Lottery 2018 Mumbai online application form for 1384 flats. MHADA Lottery 2018 will be conducted in the month of November this year. Online lottery system will be made easy and user friendly for applicants. All the houses are priced less than the original market rates. There are 283 houses for Economically Weaker sections, 500 for Lower Income Group, 216 for Medium Income Groups, 2 for Higher Income Group. 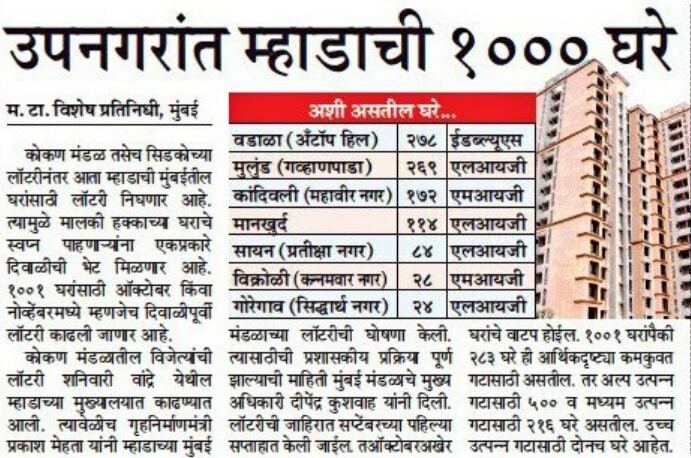 On 25 August 2018, lottery results were out and family of the applicants who have won 9,018 low cost flats in Mumbai Metropolitan Region were delighted. 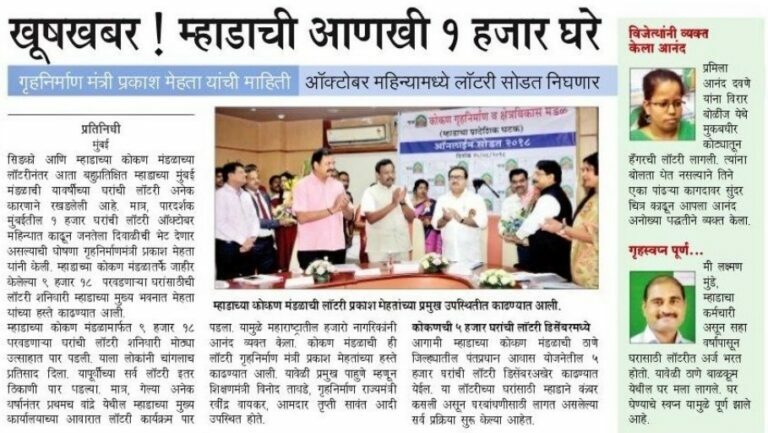 MHADA Konkan Board has organised this lottery and also comprises of houses under Pradhan Mantri Awas Yojana (PMAY) scheme. Dreams of several people who wants to own their house has been fulfilled. Pramila Davana, age 28 years won the lottery in her first attempt. DavaShe was born deaf and mute and has faced various difficulties in getting a job. After that she has taken admission into an animation course and secures a job. Then her family applied for house under the Physical Handicapped (PH) category and won a house in Virar. She was full of joy and was unable to tell her feelings in words. She then drew a sketch where she was happily surrounded by a lots of buildings. I hail from Bihar. Recently moved to Mumbai for a job and have no house in Mumbai. Can I apply for a MHADA house?